SINGAPORE: The Health Sciences Authority (HSA) has seized almost 2,000 litres of codeine cough syrup. HSA said this is one of the biggest crackdowns in terms of volume seized from an illegal supply chain. 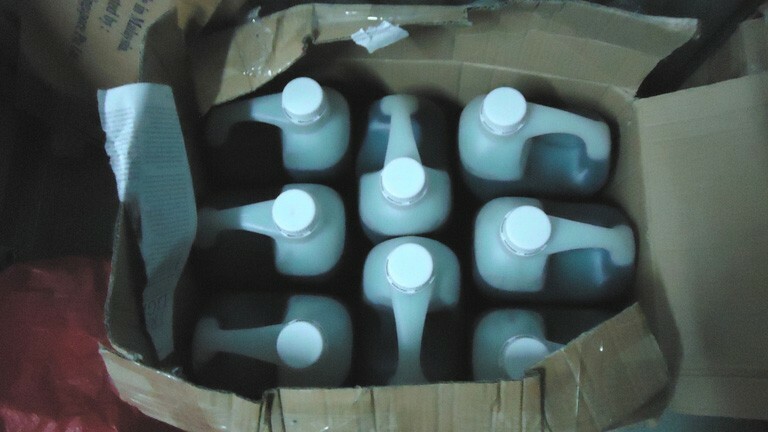 The seized cough syrup is estimated to have a street value of S$1.25 million. Four Singaporean men have also been arrested. The operation, carried out by the HSA and Central Narcotics Bureau (CNB) from April to July, targeted a suspected codeine syndicate which carried out their illegal activity at various locations. The illegal import of codeine-based syrup was first detected by the Immigration & Checkpoints Authority (ICA) officers at Keppel Distripark on March 28. When the HSA investigated, it was found that 3.8-litre canisters of illegal cough syrup were brought in under the guise of other products such as tire shine, porcelain cleaners and degreasers. The suspects brought the canisters of codeine to a residential unit and another rented storage facility. The codeine was then processed and repackaged into smaller quantities, before being distributed to the black market. Codeine cough syrups are used medically as a cough suppressant. They are classified as pharmacy-only medicines, and can only be supplied by a licensed pharmacist or a licensed medical practitioner. Codeine cough syrups, if used without proper medical supervision, can often lead to dependence, as well as other side effects such as nausea, vomiting, constipation and confusion. When taken in excess, they may cause hallucinations, a decreased heart rate and breathing problems, leading to coma and death. Anyone caught importing, selling or possessing products containing codeine without a licence can be fined up to S$10,000, jailed up to two years or both.